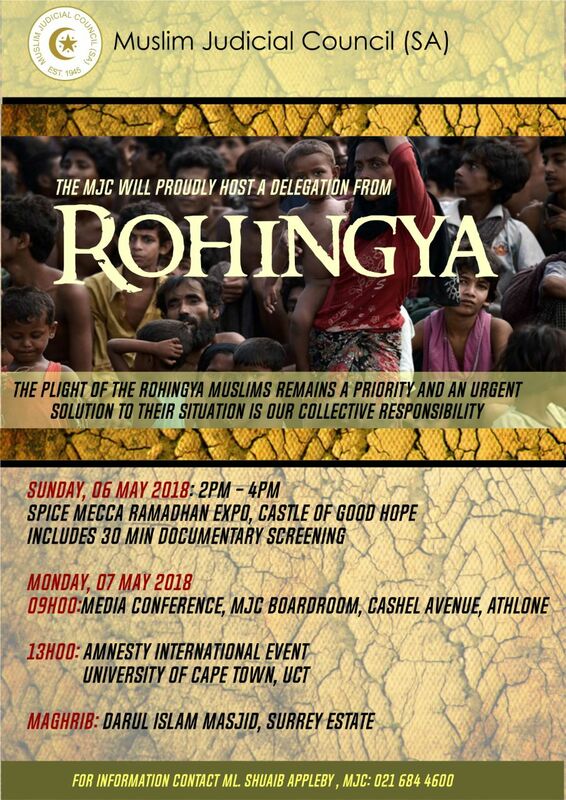 The Muslim Judicial Council (SA) is delighted to host Rohingya activists Nay San Lwin and UK-based documentary filmmaker Shafiur Rahman as part of the South African Rohingya Events Week from 1 – 7 May 2018. The speakers are guests of Protect the Rohingya — an awareness group which began in July 2012 with the aim of creating awareness on the plight of the Rohingya. The activists will be addressing events in Johannesburg from 1-4 May, Durban 5 May and Cape Town 6-7 May. Over a period of 15 months, Bangladeshi-born filmmaker, Shafiur Rahman, has documented the Rohingya refugees in Bangladesh. His film on Tula Toli was the first to expose pre-planning on the part of the Myanmar Army. Trafficking of Rohingya women and children and the difficulties faced by newly arrived Rohingya women are two of his other ongoing documentary projects. A proud Rohingya, outspoken international activist and writer from @Rohingyablogger. He has been on every major international news network and has addressed various conferences on the Rohingya issue.